I found this book in a used bookstore stuffed between hundreds of biographies and memoirs. Something about the cover caught my attention. Not because of the cover (although it is cute) but because I couldn't help wondering why the number twenty-nine and why would they be giving gifts. I'd recently read a book about gratitude with thank-you notes, so this seemed to compliment that. I set a goal to read a memoir this month and in the spirit of minimalism I wanted to read something I already owned. This book had been sitting on my shelf for over two months and it caught my eye as I worked at my desk one day. I pulled it out and cracked open the cover to skim the first page. If a book can't grab me on the first page, then it's not going to keep my attention. As I skimmed I found myself sitting there thirty minutes later still reading ~ it was a keeper. It's the story of a woman who was diagnosed with MS (multiple sclerosis) and who is feeling suicidal. She calls her spiritual director who gives her a "prescription". 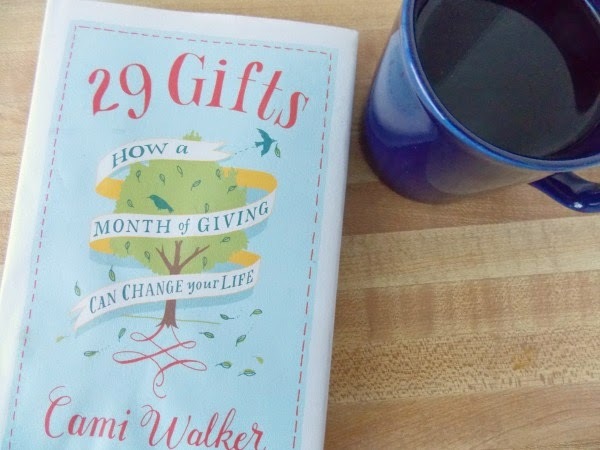 The prescription is to give away 29 gifts in 29 days. The gifts don't have to be expensive or even materialistic things ~ time and attention could count. I won't spoil the story for you, but through her process and the simple act of giving, her entire life begins to change. It has inspired me to consider taking the challenge myself. Have you ever done something like that? Has giving ever changed your perspective?